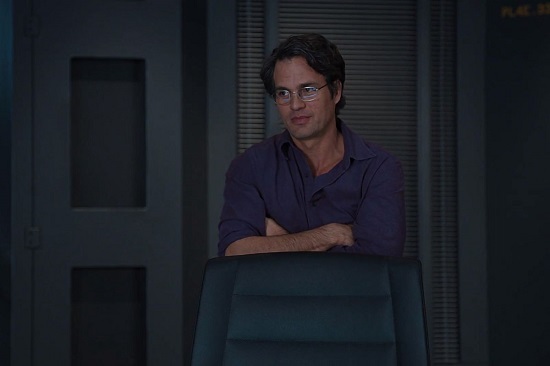 Bruce Banner, looking unhappy. Image source. "You haven't fixed this yet?" his boss said in Portuguese, gesturing toward one of the factory machines. Okay, thought Bruce, be calm, don't get angry. "I worked ..." he answered, in broken Portuguese, trying to stay calm. "... You said ... fix the power supply ... is more important." "No!" the boss answered. "I told you to fix this one!" Okay, that wasn't true though, thought Bruce. His boss had said yesterday the power supply was a higher priority. Anyone who is angry with his brother will be subject to judgment, thought Bruce. Love your enemies. Take captive every thought to make it obedient to Christ. He couldn't let himself get angry. He couldn't give in to the temptation, no matter what the boss did, it wasn't an excuse to sin. Think of God, think of God's love. Jesus, help me. Love, love your enemies, like Jesus did. Just think good things. Don't feel. Jesus doesn't want me to get mad. He looked down. He didn't answer, because he didn't trust himself to answer without getting angry. Just submit, he told himself. He nodded. He'd just try harder and do what his boss said. Okay, it's going okay, now he just needed to remove himself from the situation before the temptation got worse. He looked down and nodded again. After a few seconds, the boss left without another word. All right. Success. He didn't sin. He didn't give in to temptation. He controlled it. But a few hours later, he maybe didn't want to praise God. That was a success? He had stomped down all the anger, he was very very nice and polite, he didn't hulk out, but ... why did he feel so terrible? This is gonna be my whole life, he thought. Best-case scenario, I control it, we never see the other guy... and I feel like crap. Because what I did this afternoon... I can't keep doing that. I can't live that way. Focusing so hard on fighting the temptation, I could barely even think. I can't force myself to not feel my feelings. Even though that's the only way to not sin. It was too much. Too hard. He had dedicated and rededicated his life to Jesus too many times, and still he could barely control his ... the other guy. I can't live like this anymore, he thought. I just can't. Bruce opened his closet door and pulled out a pile of blankets. And there it was, underneath, where he had hidden it. A gun he had stolen. Because... he thought it might come to this. He stole this gun in case he ever needed to kill himself. Yeah, he was a thief. Yeah, it's one of the Ten Commandments. Add that to the list of all his other sins. God, you have to understand, he prayed, I keep hurting you with my sin, I can't stop it, can't control it, I'm crucifying Jesus over and over again, wouldn't it be better if I just died? Bruce prayed, but didn't listen for an answer. He didn't really want to hear from God right now. Because God would definitely disapprove of his plan. God would want him to repent instead. Well, whatever. He already knew he was going to die here, in his sin, and probably go to hell. But at least then he couldn't hurt God anymore. He wouldn't be wasting God's time with his pathetic prayers, wouldn't be breaking God's heart over and over. I'm really going to do it, he thought. Finally this is going to end, and I won't have to fight the other guy anymore. He was actually feeling relieved. Bruce was no match for the Hulk- even with the Holy Spirit supposedly living in him... well, probably he wasn't getting help from the Holy Spirit anyway because he didn't pray enough and he wasn't devoted to God enough. And he had never even tried to look for a church after moving here. Whatever, it doesn't matter anymore. He wouldn't be stuck in this losing battle anymore. He decided to go outside, to go into the forest where no one would find him. "Where can I go from your spirit, where can I flee from your presence?" Ugh, why did a bible verse have to pop into his head right now? Okay fine, God knew where he was, God knew what he was doing. Whatever. He was in rebellion against God anyway. He wasn't going to pray anyway. God was too pure to look at sin, so it would be better for Bruce to not even try bothering him. He was alone, outside, in the middle of nowhere. There was no hope. Every thought he had was a sin. Just piling up higher and higher, burying him. There was no way out. He could never be good enough. He could never get his flesh to surrender to God. He had tried and tried and just couldn't stop himself from sinning. He could never please God. Just this one last sin, and that would be the end of his fight. He was so tired. Bruce closed his mouth around the end of the gun.